At the beginning of spring training, we all knew what was going to happen with the rotation. Disco, Homer, and Finnegan were locks. So was Feldman, probably. That left a bunch of guys fighting for the last spot, but we all felt more or less certain that it would come down to Robert Stephenson or Cody Reed. Then something funny happened. (Not “haha” funny. More “tortured sports fan” funny.) Homer and Disco went down, and neither Reed nor Stephenson is in the rotation. Instead, we have Amir Garrett and Rookie Davis, who may not have been on your radar. So what’s that all about? Davis, it should be noted, was dealing with an injury last year before he came into camp hurling 93-96 MPH. That’s significantly harder than last year and obviously changes the calculus on him. But what made both Garrett and Davis standout the most was the way other people talked about them when they were mentioned, and the way each player talked about baseball. Both were generally regarded as extremely driven and very coachable. Those are two good qualities. In my own conversations, I heard Rookie Davis talk about how he wasn’t necessarily a SABR guy…and then immediately talked about how he does pay attention to his spin rates. 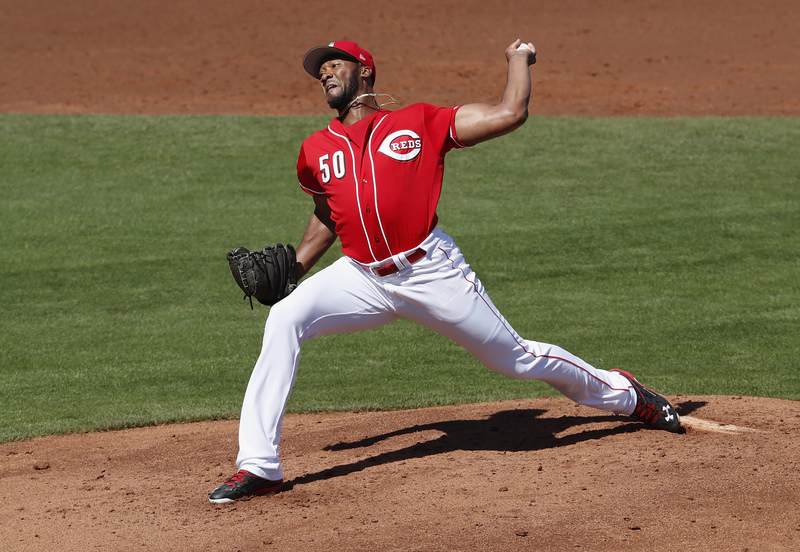 Amir Garrett had a couple of games in Louisville where his mechanics fell apart, after which he immediately sought coaching to correct the problem, something mentioned to me by both Bats manager Delino DeShields and Garrett himself. It worked, by the way. Garrett followed up an appearance in which he went 0.2 innings with 4 walks and a HBP with 7 innings of 7-strikeout, no walk baseball. Having not had enough exposure to Rookie Davis with his new level of stuff, I feel much more qualified to talk about Amir Garrett. I think, overall, Garrett’s floor is Bronson Arroyo (the younger version). However, I’ve seen enough to know that if he puts it all together consistently, there’s no ceiling. When his stuff is working, there’s a 15 MPH difference between his fastball and changeup, and he makes batters look silly with it. I think what we might see this year is something akin to Johnny Cueto’s first season: Flashes of brilliance, but also some uncertainty as he finds himself and adjusts to the major league level of competition. But don’t be surprised if he makes at least a little Rookie of the Year noise (no, I am not kidding). With Davis there is more uncertainty. But I can tell you that, as with Garrett, there is an air of “tell me how to get better” that follows him, and that, combined with solid results, is likely what landed him a spot on the rotation. I have a reputation as an advanced stats guy, but last year with the Bats, I saw something that changed at least somewhat my approach toward evaluating players. There are certain guys who seem to impress people on both sides of the line—the stats guys and the old school guys. And those players are the ones who often come up with the best results. It’s this kind of balanced thinking that helped get Garrett and Davis into the rotation this year. And will hopefully get the Reds playing winning baseball again soon.